In order to help raise that money, numerous fundraising events are planned throughout the year. Some of these are organised by people in the community, others by the hospice fundraisers themselves. In many cases they take part in even bigger general fundraising events. The next one of these coming up is the The BUPA London 10,000. This is the 10k version of the London Marathon and passes many of the same famous sites around the city. Mo Farah, Olympic and World Champion in this distance, runs this race every year and so it is a chance for people to follow in his footsteps around this beautiful course. "St Raphael’s have 24 places in this event and are looking for people to run on our behalf. We ask for a minimum sponsorship amount of £150 and I will be on hand every step of the way to help people achieve this target. We will supply runners with a free fundraising pack and St Raphael’s running vest and will be there cheering on our runners on the day. The places are allocated on a first come first served basis and the deadline to register is Friday 25th April." 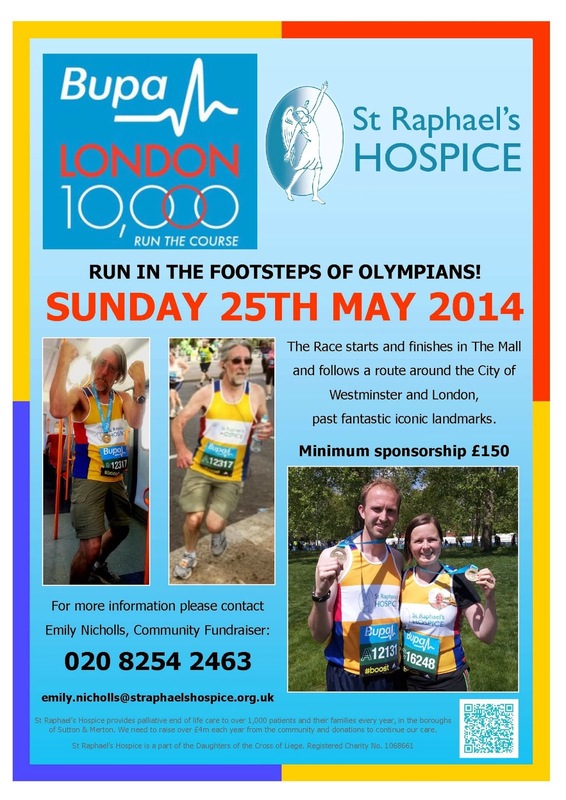 So if you're up for a run and want to help St Raphael’s, contact Emily on 020 8254 2463 or by email: Emily.Nicholls@straphaelshospice.org.uk, or indeed the main office on 020 8254 2450.